Robin is the seventh member of Straw Hat's Crew. She had a bounty of 79 million beri (One Piece currency) since she was eight years old, during an incident in which she supposedly destroyed six Buster Call ships through the use of the powers she gained by eating the Hana Hana no Mi (Flower Flower or Blooming Blooming Fruit). The fruit's power enables her to conjure up multiple replicas of her body parts (most often her arms) upon any surface she is able to see making her very powerful and dexterous as a result. Robin joined the Straw Hat Pirates after Luffy saved her life, or (how she states it) Luffy forced her to live when she wanted to die. To atone for his crime, Robin demands that Luffy allow her to join his crew, to which he complies leaving every other crew member except Sanji in shock. Although feared at first, she is quickly accepted and viewed as a comrade by the crew. Robin is actually an archaeologist of talent, and despises anyone who thoughtlessly damages any piece of history. The World Government fears her because she can decipher Poneglyphs (stones marked with glyphs from an ancient language), which contain details capable of reviving ancient weapons that have the power to destroy the world. In reality, Robin has stated that she does not care about ancient weapons, and that her dream is to find the True History written on the Rio Poneglyph. 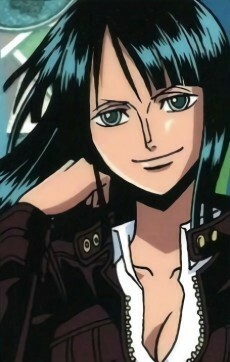 Robin is a mysterious and serious person who appears quiet and reclusive, and the wisest in the Straw Hat's Crew. She was thought by those around her to be cold and mean, but it was proven that she is actually a kind person who always thinks before she acts. She often only speaks when something interesting or important has happened. She loves to study history, and the comfort and freedom to study and read. She is also quick to point out gross or realistically morbid facts, often creeping out Nami or Usopp. Robin is the wisest and most sensible member of the crew. She has a vast knowledge of the seas and the world, and usually keeps her head during surprising situations, allowing her to logically analyze the situation without losing her cool. This trait makes her different from the other Straw Hats, who often comically react melodramatically to unexpected happenings and hold irrational ideas and conclusions. Despite her attempts to keep herself distant, Robin has fallen for her new friends, and has taken the role of the distant den mother.